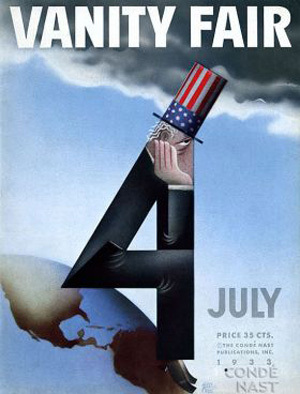 July 2, 2011 ~ As Steven Heller writes, in a most interesting article on Paolo Garretto, "there was hardly a noteworthy American magazine that had not published Paolo Garretto's work at one time. There were virtually no French, Italian, English, and German poster hoardings or kiosks on which his advertisements did not regularly appear. His airbrushed caricature epitomized Deco styling. During the Twenties and Thirties he was a master of international advertising design and editorial art." Born in Naples in 1903, Garretto became a Fascist sympathizer early in his life. When Italy attacked France in 1940, however, he fled to the United States and continued to work for Conde Nast publications. His past soon caught up with him. As the New York Times wrote in his obituary on August 9, 1969, "when World War II broke out, Mr. Garretto, an Italian citizen living in the United States, was interned as an enemy alien and deported to Italy. He was approached by the Nazis to produce caricatures of President Roosevelt and other Allied leaders. When he refused, he was interned as a political prisoner in Hungary from 1942 until the end of the war."